When it first aired in 1959, The Twilight Zone was nothing less than groundbreaking television. Freed from the censors’ strict oversight due to the show’s classification as science fiction, the 156 episodes explored classic, powerful, and moving human themes—love, hate, pride, jealousy, terror—in a unique style. The program sparked the imaginations of countless writers and filmmakers around the world. With The Twilight Zone 2, some of today’s finest writers have written all-new stories celebrating the unique vision and power of Rod Serling’s landmark series. 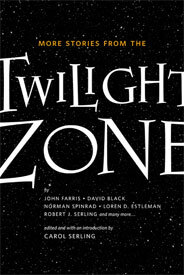 The previous anthology boasted a stellar group including New York Times bestselling authors Whitley Strieber, R. L. Stine, and Laura Lippman, and writers who wrote scripts for the original Twilight Zone and its later incarnations, such as Earl Hamner and Alan Brennert. So as Rod Serling said, “…prepare to enter that fifth dimension, beyond that which is known to man. It is a dimension as vast as space and as timeless as infinity. It is the middle ground between light and shadow, between science and superstition. And it lies between the pit of man’s fears and the summit of his knowledge. This is the dimension of imagination. It is an area which we call…The Twilight Zone.